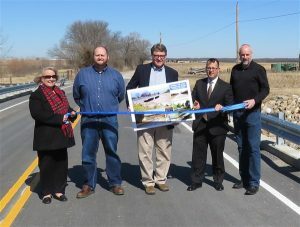 GUY Engineering and Washington County held a ribbon cutting for Bridge #8 over Unnamed Creek on February 26 at 11:30 am. This bridge is in Washington County District 1, served by Commissioner Mitch Antle. The old Bridge #8 was a 51ft long steel flatbed railcar span with a 20.4ft wide steel deck and concrete abutments. 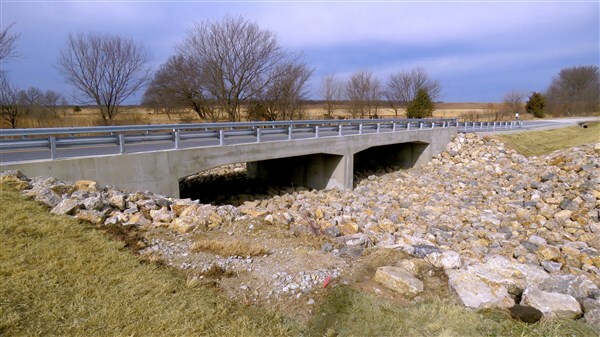 The replacement bridge consists of two 32ftx9ft precast concrete arch culverts. It was designed by Guy and constructed by B&B Bridge Company. By modifying the alignment slightly, GUY was able to avoid a high-pressure gas line and thus reduce project cost for this $630,000 bridge replacement. Funding for this project was provided through a combination of local funds, County Improvements for Roads and Bridges (state funding), and Surface Transportation Program (federal funding).